Director Justin Lin, who is currently busy filming the sixth entry in the Fast & Furious franchise, is lining up a bit of a departure for a future project. Per Vulture, the Fast Five helmer is in talks to direct the racially charged drama L.A. Riots. The project has been in the works for years, and originally Spike Lee was set to direct the pic before postponing the project due to budget issues. Now it appears that Lee is off the film altogether, and Lin may be the guy to finally get this thing into production. Hit the jump for more. The story centers on the 1992 riots in Los Angeles that erupted after a jury acquitted four LAPD officers accused in the beating of Rodney King, which was caught on video. 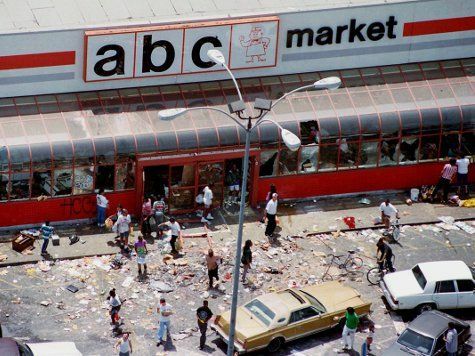 The riots lasted over six days and left 53 people dead. This is certainly touchy subject matter, and Lin isn’t exactly the first person that comes to mind when thinking of directors to bring the events to the big screen. Though his recent output is geared towards entertainment fare—Fast & Furious, Annapolis, Tokyo Drift—Lin initially burst onto the scene with his crime drama Better Luck Tomorrow. That film was highly praised for its portrayal of Asian American youth culture, so I actually think Lin is an interesting choice to helm L.A. Riots. Vulture reports that the existing script was written by John Ridley (Red Tails), but it’s unknown if Lin will be working from that screenplay or if he’ll start from scratch. When the project lingered in development, Lee railed against Universal’s decision to balk at his $35 million budget for the drama proclaiming, “How can you scale back the LA riots? !” Lin has a healthy relationship with Universal on the Fast & Furious films, so hopefully he can get the film made for the budget he needs. Though I think it’d be a fine move to have Lin helm L.A. Riots, there’s no guarantee we’ll see the film anytime soon. Lin is busy with Fast & Furious 6 for the time-being, and there’s also been talk of a seventh installment not far behind. He’s also attached to Lone Wolf and Cub and an adaptation of the play Chinglish, so who knows what he’ll choose for his post-Fast 6 project.